My best friend in my office building is retiring this week. And he loves budgies. He has six of them in a huge cage at home and they all are handpicked because of their unique colours and patterns and genes. 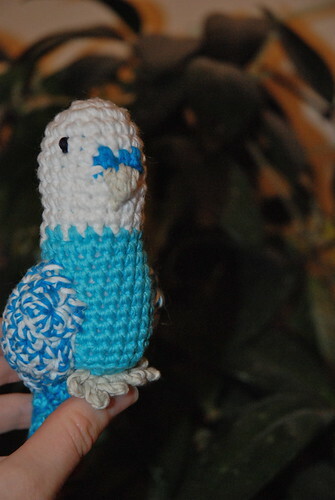 I made him a crocheted version of a budgie and hope he’ll like it. The pattern is made by Crochetroo (Etsy-link here, Ravelry-link here) and is called Budgerigars (Ravelry-link here). I used a 3.5mm hook and the yarn is Alba from BC Garn. Alba is an ecological cotton that you can get in a lot of different colours. I bought mine at Fröken Garn in Malmö, Sweden. I liked making this little guy (named Drogba as the football player in Chelsea) but I’m having a hard time with patterns that involves a lot of sewing. Attaching limbs make the perfectionist in me cringe. I’m never quite happy with the turnout. When I have some time over I’ll make Drogba a friend or two. I have yellow and green yarn I can use as well. And some grey. 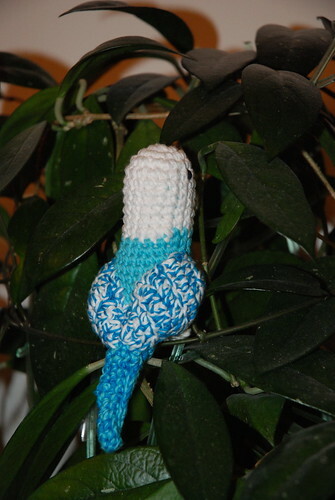 This entry was posted in Creative, Crochet, My everyday life, Work and tagged amigurumi, bird, creative, crochet. Bookmark the permalink. Didier Drogba drives me nuts. Such a diver, such a whiner. Then he hooks one into goal and I can’t help but admire him! Anna! You are so clever! What an adorable budgie!